What is the best food for a dog? The dog food area is a very complex and difficult discussion; almost like religion .... individual believes and individual truth , you must find your own....! 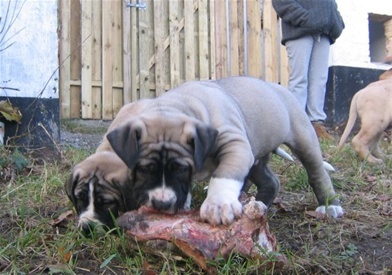 For us it works best by looking at dogs as natural beings ,who are designed to hunt and eat other animals. But this is easy said, to practice it is quite more challenging... we have try to feed our dogs on BARF diet for about two years ,doing so is very expensive and not simple at all ! Also to secure the right amount of vitamins and minerals is almost impossible , you must take in to calculation that the natural predator does in fact eat whole animals ,plus a loot of organic stuff it finds in its natural environment . To copy those conditions in to a food bowl can not be done 100%. We think to have found the most manageable compromise for our dogs, we feed them a basis dry food product and give them loots of supplements in form of bones, carcase ,whole chickens , meat and fat on a daily basis . The dry food we use is a mixture of about 6 different brands, we mix it to get the right combination of proteins ,fat and energy. 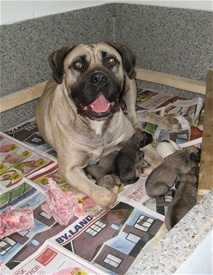 The problem with dry food is that the god and most appealing brands have to high levels of protein, causing the young boerboels to grow and take on body mass to fast, mastiff breeds like our own need to have a relative slow growth so their skillet can develop before the body mass comes ! On the other hand the brands with lower levels do not contain al the god supplements that are so important for giant breeds.... so we simply mix them together until we get the numbers we find reasonable! After 2 years with barf feeling we could see that the end result was not so different than before, areas where we could see clear benefit where around females who gave birth and raised puppy's, we have never seen females recover so fast and being so fit true the whole process as when barf feeding ! Also the "pack energy" in general is more in balance when eating raw food, whether that is caused by them being so dam tyred from all the bone chewing or the natural food does release energy on a more balanced level, we don't know .